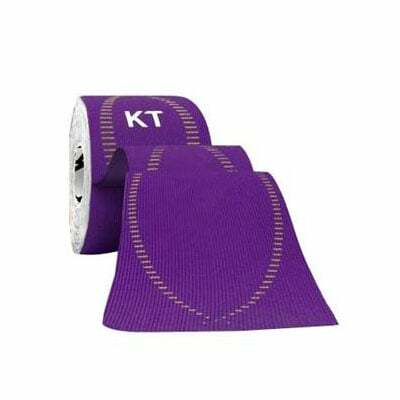 KT Tape Pro Synthetic Tape, 2"x10" Strips 20ct - Epic Purple is a specialty athletic tape that is designed to offer stability and support to muscles and joints without restricting movement and motion. The tapes are available in a range of sizes and colors. KT Tape Pro was designed to relieve pain and provide support exactly where you need it. This tape will stay in place through multiple demanding workouts. KT Tape Pro is 100% synthetic and will stick with you in the harshest conditions including showers, humidity, cold and even in the pool. Relieves Sore Muscles, Joints and Tendons: KT Tape pro provides support that will endure your toughest workout. It provides pain relief and will stay in place during multiple, demanding workouts for up to 3-5 days. Its' the worlds only 100% synthetic kinesiology tape that can outlast anything you can throw at it. Stronger Adhesive: KT Tape performs in the harshest environments such as daily showers, humidity, cold or in the pool. Under these conditions this tape can last up to 3 days. This adhesive will go on as long as you do. Superior Support: KT Tape provides support for muscles, joints and tendons without restricting the comfort or range of motion as the fibers feature a much longer elastic core. Longer Lasting: This tape retains is elasticity far better over time than cotton kinesiology tapes. This means that it will provide a stronger support as long as you need it and then some. It relies on both strength and endurance to get the job done. Synthetic Microfiber: Can be warn comfortably in the shower, in the pool or even while riding the big waves at the beach. Synthetic microfibers are fast drying and provide superior weight-to-strength ratios. These fibers are also naturally anti-microbial which allows for more comfortable extended wear without the funk. Reflective Safety Design: KT Tape pro was designed with reflective elements that add even more functions to its form. This tape is perfect for low light conditions, road training and reflecting the flash of action-shot paparazzi. Latex Free for Sensitive Skin: The acrylic based medical grade adhesive is gentle on the skin. That means that you can scratch your itch to exercise without having to scratch the itch that often comes with braces and traditional athletic tape. Contains 20 pre-cut KT Tape Pro Synthetic Tape.